If you ask Colt auto fans which series is their favorite, many will say the Series 70. A case could be made that the pre-war commercial Colts are more elegant and finely rendered, but surviving examples of these are expensive collector items, often commanding several thousand dollars in like-new condition. The Series 70 Colts, while no longer in production, can still be found in excellent condition at reasonable prices. 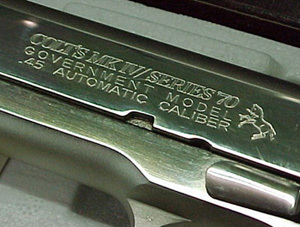 The Series 70 Colts were produced between 1970 and 1983 in Government Model and Commander sizes. To all outward appearances, the Series 70 is a gussied-up M1911A1. It has the frame, sights, and arched mainspring housing of the M1911A1. The roll stamping, seen at the right, makes clear it’s commercial intention. Inside, there are some refinements. It has been often noted that the G.I. M1911 and M1911A1 pistols were designed for reliability, not pinpoint accuracy. They were deliberately built with liberal tolerance so that they would continue to shoot if they were dirty, or dropped in the mud or sand. “Some hang up on the 50 yard target performance of the G.I. M1911A1 Pistols. Moderately loose G.I. Pistols typically printed 5” to 6” groups with G.I. ammo. Max. spec. (loose) pistols typically fired 8” to 10”+ groups. Keep in mind that personal defense range is typically less than half of 50 yards. Also consider that a 10”/50 yard group would correspondingly reduce to about 5” at 25 yards and to about 2”+ at 10 yards. This tells us that the accuracy of the average G.I. pistol was more than adequate for its intended purpose. From the ordnance development viewpoint, trying for match accuracy was counter productive – in fact, downright silly, in a combat pistol – it was better to opt for a pistol that would shoot, no matter what. Human nature, being what it is, will always lead some to search for the best of all possible worlds – match accuracy and 100% combat reliability. It was this quest that led to the most distinctive innovation of the Series 70 pistols: the collet style barrel bushing and it’s accompanying barrel. 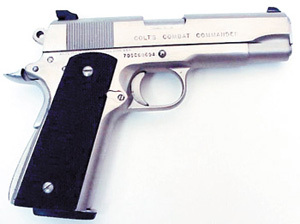 Prior to the advent of the Series 70, Colt auto shooters had two basic choices: the very tight, target-tuned National Match or the M1911A1, albeit repackaged and finished nicely. The Series 70 attempted to hit the middle ground between the National Match and the M1911A1 by delivering better accuracy than the M1911A1 and better service reliability than the National Match. Accuracy in an autoloader comes from a consistent barrel lock-up when the gun cycles and reloads itself. If the front of the barrel is wobbling around, the lock-up will not be consistent. In the M1911A1 this means having a barrel bushing which is closely fitted. Colt engineers were faced with a choice: either they could hand-fit the bushings and thereby create a prohibitively expensive manufacturing process, or they could design a bushing which, in essence, fitted itself by its shape. They chose the latter and the collet bushing was born. 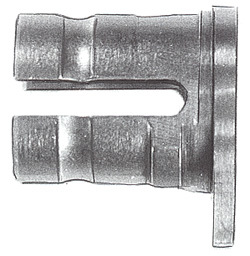 The collet barrel bushing has four “fingers” rather than the solid tube of the G.I. bushing. The “fingers” exert a sort of spring tension between the barrel and the slide to produce a better lock-up. The Series 70 barrel is raised slightly in the area where the bushing makes contact with it. The collet bushing, like every other modification of the original Browning design has proven to be controversial. While it does deliver improved accuracy, its design made it prone to breakage. Also, it fits much more tightly than the M1911A1 bushing, making it harder to remove and many gunsmiths advise pulling the slide back about an inch or so to relieve pressure on the bushing before removing it. The Series 70 pistols do not have the lawyer-safe firing pin block mechanism of the Series 80 Pistols. 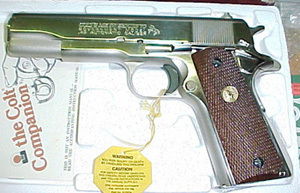 Many of the most eye-catching Colts are Series 70 pistols. These were built prior to the usage of stainless steel and they have rich nickel plate or blued finishes. I have heard nickel plated Colts with mother of pearl grips called “pimp guns” but the do have a way of standing out in a display rack. The blued finish is rich and deep. These guns have the “classic” look and are cherished by their owners. The Series 70 Government Model Colts were chambered in .45 ACP, .38 Super, 9mm Parabellum and 9mm Steyr (for overseas sales). The Government Model has a 5” barrel with checkered walnut grips adorned with the Colt medallion. They were produced in Blue and Nickel finishes. Series 70 models were manufactured from 1970 until 1983. They were serialized with “SM” prefixes (approximately 3,000), “70G” prefixes from 1970 through 1976, “70L” and “70S” prefixes, “G70” suffixes between 1976 and 1980, “B70” suffixes between 1979 and 1981, and “70B” prefixes between 1981 and 1983. Series 70 Combat Government – .45 ACP bluish-black metal finish, features modifications for combat shooting and is the forerunner to the Combat Elite. Series 70 Lightweight Commander – Chambered in .30 Luger, 9mm Parabellum, .38 Super, .45 ACP. This pistol has a 4.25” barrel, full size grips and is denoted by a “CLW” prefix on the serial number. These pistols were produced from 1970 until 1983. 500 Lightweight Commanders were manufactured in 7.65mm (.30 Luger) during 1971. Most were exported but 5 were sold in the U.S.
Series 70 Combat Commander – produced in bluish-black metal finish and satin nickel. The satin nickel models are very rare.